Twenty times larger than Borobudur temple in Central Java and two times larger than the temple complex of Angkor Wat in Cambodia, no wonder the temple complex Muaro Jambi enshrinement was described as the largest temple area in Southeast Asia. 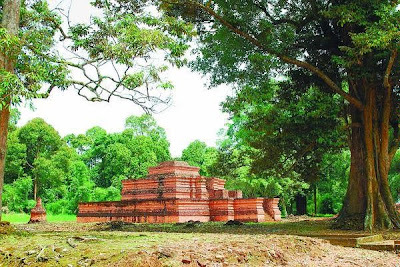 Unfortunately, this area is like a grave humanitarian legacy of eternity because none of his form intact temple.... Muaro Jambi temple complex is located about 35 kilometers north of Jambi, precisely in Muara Sebo, Muaro Jambi, Jambi Province. Amazed at the same time it seems ironic that the two words fit to describe the condition of enshrinement in the mouth of the Batang Hari River. Said amazed sticking because of this vast complex enshrinement reached 2062 hectares. Ranging from land that has occupied Archeological Heritage Conservation Center AHCC) of Jambi, people's gardens, to the canals connecting one temple with the other ones. Temples are scattered among the uniqueness of this canal Muaro Jambi Temple Complex, which was found in the complex other enshrinement in the archipelago. Noted there are 11 major temples discovered and partially restored, among them Gumpung Temple, Temple High and High I, Gedong I and II, Kedaton, Koto Mahligai, Astano, Gulf I and II, Hill Sengalo, and Twins Stone. Stretch of the temple that's not including the 82 estimated temple ruins still buried in the dirt a dozen, or so-called menapo by residents around the temple. A trace of canals and ditches in Muaro Jambi temple architecture is the concept of ancient urban planning is amazing. 2-3 meter wide trench built around the temple and serve as a barrier, while the 6-10 meter wide canal created snaking cut temples which function as a transport route. The canal was to connect with Batanghari River. Jambi BP3 researchers believe, the main transportation to the temple at that time using the boat. This transport system is like the canals in the city of Venice today. There are four channels which have been given a name, namely Canal Jambi, Malays, Suez, and the Dyke Johor. "In addition to the canal, there Kelari Lake, a small lake connecting antarkanal," said Agus. Besides the canal, there are interesting tales root among people living near the temple, the story of the failure of Datuk Paduka Raja built a temple idol skies overnight, which was asked by the Princess Pinang Masak. Because of annoyance, the king of the temple was kicked up scattered and form small temples. Briefly, the story is much like the legend of Bandung Bondowoso who failed to build a thousand temples for Roro Jonggrang, or Sangkuriang who did not succeed in making a boat and a lake for Dayang Sumbi. After being pampered sense of wonder, irony emerges when looking at the red bricks that make up the temple was porous with age. Black shade of green moss strong glue, brick crack that extends even into the temple decoration. In fact, almost the entire temple consisted only of the foundation and body, while the top was nowhere to be tracked. Wall and gate that surrounded the temple was almost invisible scar, like a gate and wall around the temple Gumpung-discovered in 1820 and was renovated in 1982 to 1988, the only remaining part of the foundation until the waist-high calf adults. Restoration Working Group Chairman Jambi Kristanto BP3 Januardi admit, until now not known how the design of the top of the temples in the Temple Complex Muaro Jambi. Undiscovered manuscripts made in writing how the temple, and even by whom. A number of temples, such as Astono or Kedaton, who allegedly built more than one phase with a different period of manufacture was, not co-exist with the inscription evidence or historical records. Currently, Muaro Jambi Temple Complex has yet to be explored using the boat, except Temple Bay I and II, because it lies across the Batang Hari River. Traveling over some of the temple will pass a number that has been given menapo red stakes, saying the number and BP3. Menapo-menapo was located in durian orchards, duku, and the villages brown. Menapo form is like a mound as high as 0.5 to 1 meter. However, first, that menapo-high menapo until there is 3-6 meters. According to residents, the word comes from the word menapo NAPO, which is a kind of deer in the local language. When the flood, took refuge on the mound NAPO small hills. Finally, residents say the small hills that hide the NAPO menapo terms. Generally, the name of the temple following the name of the temple menapo found. Which gives the name of one village, one Astano Temple? Not only that, giant orchids, tiger orchids called jambi (Gramma top phyllum speciosum), looks exotic on the tree branches around menapo durian. This temple had been buried until it was rediscovered by British soldiers, SC Crooke, in 1820. Unfortunately, once again, because the type of stone is brick, mostly found in the temple was intact condition. The restoration of the temple will be completed gradually and one by one. Since the 1970s until today, the restoration continues, namely the Kedaton Temple.